Greetings in the name of our Lord! I am the Revd Jason Hess, a missionary Deacon tasked with leading the currently forming church plant, St. Thomas Anglican Mission in Mathews County, Virginia. We are a mission church in the Missionary Diocese of The Most Holy Trinity of the Orthodox Anglican Church. This sowing opportunity - or fundraiser, if you prefer - is in order for use to purchase the first of two necessary Heat Pumps for the facility that has been generously offered to St. Thomas for our use, as well as help with some unavoidable expenses associated with a new mission. As I mentioned we've been generously - and graciously - offered the use of a former Disciples of Christ building. We will be the sole tenants, and as part of our rent-free lease agreement we must resolve the heating issue. Until heat has been established we can not utilize our entire worship space. The necessary 5 Ton Heat Pump - that this fundraiser is for - will provide the much needed heat for the santuary space, which will allow us to hold services in there. Currently our plans involve us utilizing space heaters in the Fellowship Hall, however they can only do but so much, and there's obvious safety concerns with longterm use. After having various HVAC professionals evaluate our situation and provide qoutes, we settled on a local HVAC company that has agreed to install the 5 Ton Heat Pump and Air Handler, wire up the Aux Heat found in the Fellowship Hall's Air Handler, and do all other necessary things to ensure the safe use of the equipment. As the Missionary Deacon-in-Charge it is my prayer and hope that St. Thomas becomes a place where people hurt by the Church, hurt by their addictions, their struggles, and their doubt - some of which can be great – will have the opportunity to encounter the risen Lord; to be enveloped by his grace as found in the baptismal waters, and to mysteriously experience Christ through the sacrament of Holy Communion. I firmly believe that as these folks believe, they will see him working in and through their lives; they will encounter Jesus - week in and week out - as they engage in the life of his Church. Many of the life trials that we seek refuge from are also things that can cause us to doubt. It’s for that reason that my aim – Lord willing – is to form a community of people where the broken can find rest from the hurts of their past as they encounter Christ. The recovering will be encouraged to dream the dreams of tomorrow as they engage with the Sacraments. And the revived are challenged to change the reality of today by living into the fullness of the Christian Faith. At the end of the day that is the heart of St. Thomas Anglican Mission. Consider partnering with us as we establish a sacramental presence here in Mathews County, Virginia, by proclaiming Christ in Word and Sacrament. Greetings to the family and friends of St. Thomas Anglican Mission. Our GoFundMe campaign for St. Thomas' phase one HVAC fundraiser (restoring heat to the main worship space) is just shy of its goal thanks to the generosity of the many folks - and organizations - who believe in the work we are doing here in Mathews County. Taking into account what GoFundMe charges as their fees it would seem we're merely $40.30 from hitting the 100% mark. Thanks be to God! I've been communicating with the HVAC professionals and we're finalizing plans to have the 5-ton unit purchased and installed for our main worship space. Concerning this campaign, anything raised above the phase one goal of $8000 will go towards the phase two fund. I'll be sharing more about phase two in the coming weeks as it involves restoring the heat in the fellowship hall. Therefore giving us year round use of the beautiful building we've been blessed to call home. Again, thank you for your support, your social media shares, and your prayers. Quick campaign update... on Whitsunday (aka Pentecost) we crossed the $3000 mark for phase one of our HVAC need. Thanks be to God! Though we're moving into the season of air conditioning, we're still raising funds to get the heat restored before the end of Summer. Phase one - which is the purpose of this campaign - is for a 5 ton heat pump that will cover the main worship space. As it's a heat pump it will not only provide heat, but will also provide more efficient cooling as well. Phase two - which is a hurdle for another time - will cover the 3 ton heat pump unit which is needed for the fellowship hall. 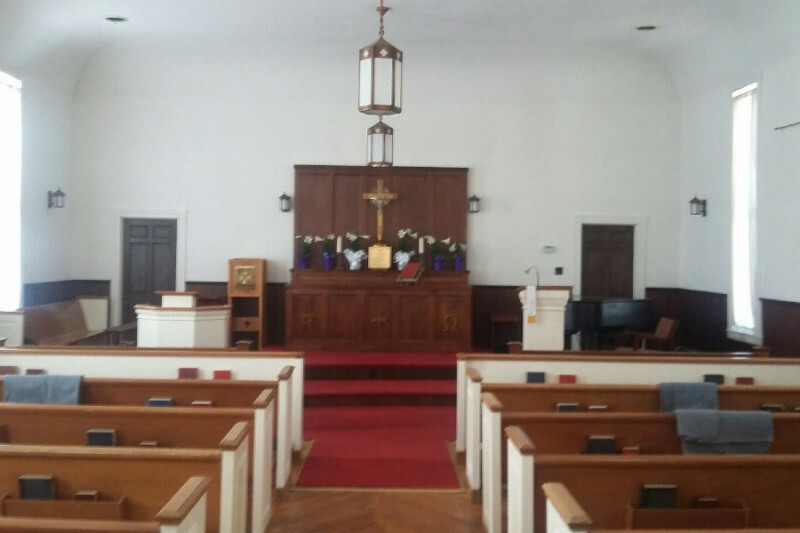 Church update... For those that didn't see the pictures from the Sunday after Ascension (aka Mother's Day) a little over a week ago, we were blessed to have our first episcopal visit. Our Archbishop, Thomas E. Gordon, came to Mathews County. While here he consecrated our worship space, baptized one of our congregants, preached, and celebrated Holy Communion. Afterwards we had a light reception. It was a wonderful service. Thank you for your prayers, and support! This past Easter Sunday was our first public service and it was a bit chilly in the building, but thankfully we've got a few pew blankets - and shawls - for people to warm up with. Despite the chill, Christ was proclaimed in Word and Sacrament as we celebrated the victory of the Resurrection. Over the last few months many things have come together to make St. Thomas become a reality. Some of which you get glimpses of in the various pictures of our journey posted on both our Facebook page, and our website ( www.MathewsAnglican.org). While temperature are slowly rising and Spring time is upon us, we're still raising funds to get our heating situation resolved before the cold returns in the 2018 Fall season. In the coming weeks we will have our current - yet quite aged - AC system looked over to insure it's fully up to speed for the warmer weather. A nice perk of reaching our goal is that in getting the heat restored, we will also have a more efficient AC as well. Thank you for your support, your prayers, and your words of encouragement as we've moved ahead one step - one day - at a time. This past Sunday was a truly wonderful service of firsts. As I mentioned above it was our first public service as a faith community, but that's not all. It was also our first celebration of Holy Communion, and our first Easter. April 1, 2018 will forever be a memorable moment in the history of St. Thomas Anglican Mission. If you're able, we would love for your to visit if/when you're able. 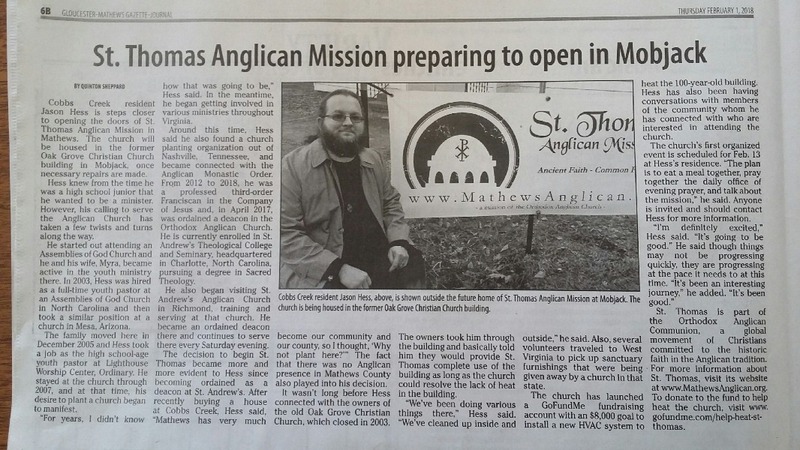 Exciting things are occurring here at St. Thomas Anglican Mission. First, in a little under two weeks we will be having our first gathering. This initial get together will be on the evening of Tuesday, February 13, at my residence. As this is our first time coming together we will be sitting down to share a meal, followed by an Evening Prayer service. It's my hope that as we gather we will begin to forge the bonds of community, as well as start the process of establishing our liturgical rhythm together. Secondly, as of the writing of this update the GoFundMe campaign has raised 1/4 of the necessary funds for the first phase of our heating project. To those who have gave either through the GoFundMe platform or gave offline (in-person, or by mail)... THANK YOU! Your generosity in helping to get our humble mission off the ground at the former Oak Grove property is greatly appreciated. Thirdly, two weeks ago I had the chance to sit down with one of the reporters from the local newspaper for an interview about the Mission. Today, February 1, the article ran in the paper (see attached photo). The unsolicited interest in the St. Thomas by the newspaper has been a tremendous blessing as this is the second story they've ran. The first one from August 2017 can be read here ( http://goo.gl/uco5HP) for those that missed it. Stay tuned for further updates on both our first gathering, as well as progress with the building. Feb 1st article in the Gazette-Journal.